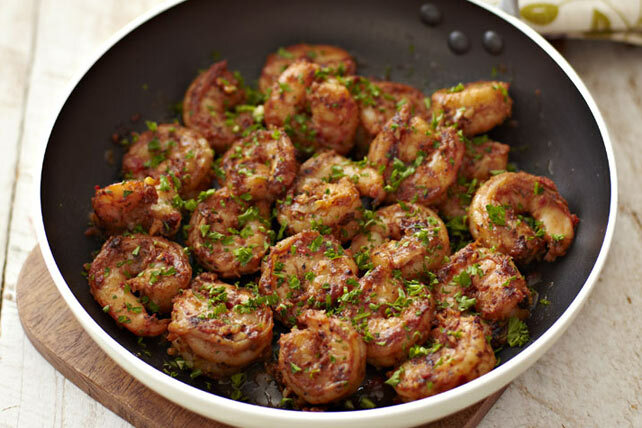 Shrimp dishes generally are quick to make, so it may not surprise you that this one is, too. What may surprise you is just how quick. Cook and stir garlic in dressing in skillet on medium-high heat 1 min. Add shrimp; cook 2 to 3 min. or until pink, stirring occasionally. Top with parsley. Serve with hot cooked brown rice and peas. When every minute counts, substitute 1 Tbsp. bottled minced garlic for the minced fresh garlic.